Manchester United yet again find themselves in a spot of bother after injuries to key players in the midfield in their last match against Liverpool at Old Trafford in the last weekend. Ole Gunnar Solskjaer has a very big decision to make with almost nine first team players out injured for the Red Devils. The United midfield will be without the presence of Ander Herrera and Nemanja Matic, with the former injuring his hamstring against Liverpool, while the latter having a muscle injury in training. The defence will be without Phil Jones, who is out with illness, and club captain Antonio Valencia, with the captain out yet again due to a calf injury. Matteo Darmain and Marcos Rojo are back in training but is not expected to start against Crystal Palace today. The attacking department too is a bit stretched, with Marcus Rashford likely to be rested after injuring his ankle and playing with a knock against Liverpool. 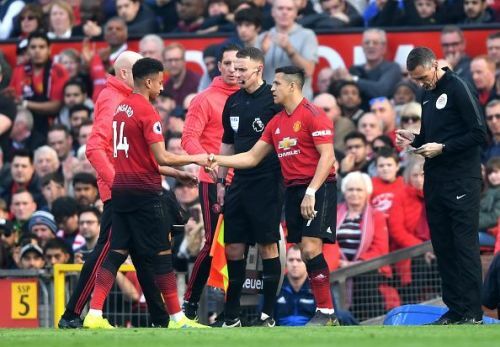 Jesse Lingard and Anthony Martial are also out, with the former out with a hamstring injury while the latter still recovering from his groin injury. Juan Mata who was another victim in that incredible first half against Liverpool that saw 4 injuries. The Spaniard is also out with a hamstring injury. With all these injuries in the squad, let's take a look a three possible ways Manchester United is expected to line-up under the Norwegian. With almost all his first choice attacking players ruled out, Solskjaer might be tempted into changing a formation a bit to accommodate his fit players. The Norwegian used a 4-2-3-1 formation during his time with Molde and might be enticed to doing the same against the Eagles. Paul Pogba and has been the main man for Solskjaer and he is expected to be running the show once again in the heart of the pitch. David de Gea will be another sure starter on the team sheet. 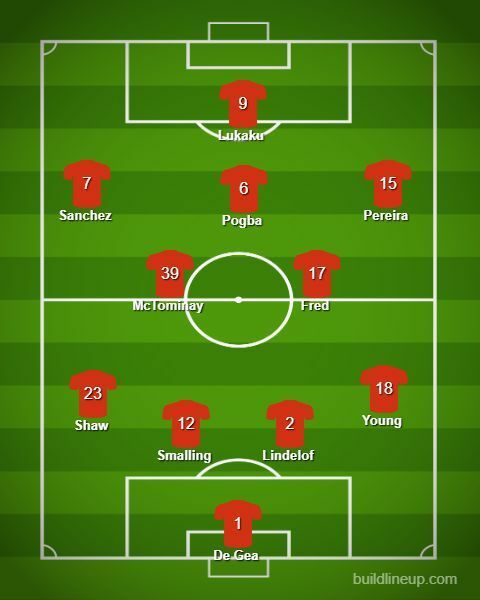 After a commanding performance against Liverpool in the weekend, Solskjaer is expected to start with the same lineup with Smalling and Lindelof at the heart of the defence, with Luke Shaw as the left back. The right-back position might see a change with Diogo Dalot replacing Ashley Young if Solskjaer feels the veteran is a bit off today. The two central midfielder spots in the formation are likely to be filled up by Scott McTominay and Andreas Pereira, after their commanding performances against Liverpool. The Scotland international was so impressive that Solskjaer called him his Darren Fletcher, a player who was normally used by Sir Alex Ferguson on the big occasions. Brazilian star Fred may also feature in place of compatriot Andreas Pereira, if Solskjaer decides to play Pereira on the right wing - a position he played during his time in Valencia. The left wing is going to be occupied by Alexis Sanchez, while the strikers position will be filled by Romelu Lukaku, after the Norwegian confirmed that the duo will be starting.